Building a new playground will improve the lives of many children but it will change the lives of some. Derek is one of these children. In light of SMA Awareness month, Warwick Playground Dreams would like to share Derek’s Story. We ask that you please share his story also to bring awareness to SMA & how this playground will change Derek’s life. Thank you. Megan Cardenas, vice president of Warwick Playground Dreams joined the committee as soon as she learned about it. Building a new park was something that not only called to her, but something she held near to her heart. Megan instantly envisioned a park in Warwick she could enjoy with her whole family. When Megan was 28 weeks pregnant, she found out that she and her husband were carriers of Spinal Muscular Atrophy (SMA) and there was a 25% chance their unborn child would be affected. When their son Derek was just 17 days old they discovered he did, in fact, have SMA type 1 – the most severe form. SMA is an autosomal, recessive, genetic condition that results in destruction of motor neuron function within the first year of life. 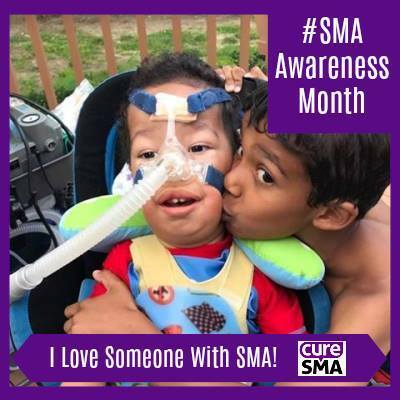 SMA is one of the most devastating childhood neurological diseases. It is the children’s form of ALS and the number one cause of childhood death in the United States. Megan and her husband, Dave Cardenes, were told that they would be lucky if Derek made it to ten months, as his case was so severe. However, Derek is so strong and determined, he continues to surpass the odds. Only 10% of kids with SMA Type 1 make it to their second birthday, but Derek is now almost 26 months old. Derek lacks the SMN1 protein needed for his muscles to work. He stopped moving his legs at two weeks and his arms at three weeks. At five months, Derek began to experience increased respiratory distress with oral feeding and was ultimately unable to tolerate feeds by mouth. He required a feeding tube to maintain adequate nutrition and the use of a trilogy ventilator to breathe. When Derek leaves the home, he has to have numerous durable medical equipment connected to his wheelchair. While SMA has robbed Derek of physical movement, it has not hindered his cognitive abilities. He uses an eye gaze system to communicate with others and fully comprehends everything going on around him. Derek loves the company of his older brother Alex, and they will often use eye gaze to play games or Alex will read to him. Megan was forced to take leave from working as a NYC English teacher in order to give Derek the care he needs. With Derek requiring a wheelchair, the family moved to Warwick, NY, to an ADA-friendly ranch home that could accommodate their son. Warwick was the right choice for them because they received so much support in a town to which they had just moved. For the first year Derek rarely left the house because his parents were fearful of him getting sick, especially after a 36 day hospitalization with Respiratory Syncytial Virus (RSV). However, as Derek has been getting older he has become more aware of the outside world and asks to go outdoors and on trips. As time went on, Megan and Dave felt more comfortable with in-home nurses taking care of Derek, so Megan began her mission to give back to a community that has given her so much.When she heard of Hannelore Chamber’s pursuit to create Warwick Playground Dreams she knew it was the perfect opportunity to give back. A first trip to the playground is a childhood milestone, and many children are missing out on a favorite past-time because local parks are not ADA accessible. Megan knows, first hand, how disappointing it can be to not have a playground that both of her children can enjoy. She was unaware, until Derek’s birth, that some children have never even been to one but hearing other local families struggle with the same issues spoke loudly to her. With that in mind, Megan created the “Play for All’ sub-committee within Warwick Playground Dreams, which is dedicated to making Stanley-Deming Park an inclusive park. This means it will enable ALL children to play there – from average to disabled – everyone can enjoy the new playground. Many children do not know how to react to children with disabilities, partly due to the fact that they never play together or are around each other. A place where all children can meet and play will help bridge such a gap in the community and create ties that were previously unachievable. Megan hopes the playground will become a place where kids can all play together, while learning about and accepting those with disabilities, like Derek. On August 19, Warwick Playground Dreams will be hosting Play for the Park SummerFest, an all-day fundraiser featuring live music, a craft beer garden, local wine, superb food, vendors and many children’s activities. Warwick Playground Dreams would like to extend an invitation to all to join this wonderful event. There is a $5 suggested donation, per adult, at the door. Warwick Playground Dreams was created by President Hannelore Chambers, who had a dream to rebuild the aging playground equipment at Stanley-Deming Park. She quickly organized other local parents who had a similar vision for the well-loved park. Over the course of a few short months, the committee grew to 24 members. Warwick Playground Dreams has been working closely with Mayor Newhard and the Village of Warwick. They then discovered Play By Design, a group of playground architects, who visited in April to design a playground created by the children of Warwick and to be built by our community.